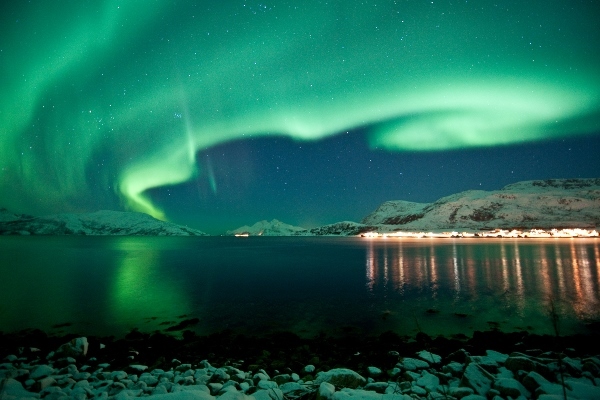 A Northern Lights trip in Norway that travels overland into the Arctic Circle. Travel by train, ship, and plane. My in-laws came to me with the idea of searching for the Northern Lights. We looked at Iceland, Sweden and Norway. The Northern Lights can be seen from around late September to early April. Norway was featured in Joanna Lumley’s hunt for them in BBC’s ‘The Land of the Northern Lights’ so I put together a trip that followed that same route. This particular journey allowed them to travel up into the Arctic Circle by train and the trip included a short flight across to the Lofoten Islands, an overnight cruise and Northern Lights excursions. The Clarion Collection Bakeriet is a former bakery turned charming and homely city hotel. Staying here puts you within walking distance of Trondheim’s top attractions, including Olavshallen concert hall, the Royal Residence, the Kristiansten Fortress, Nidaros Cathedral and the Museum of Decorative Arts. If you have more time I would suggest an extra night in Trondheim to explore the city. It’s a short walk from your hotel to Trondheim Central Station. Early start (0735) northwards by rail, travelling alongside narrow fjords, rivers and wild mountain scenery and, of course, across the Arctic Circle, arriving in the little port of Bodø at 1728. Your hotel is a short distance from the train station so after a quick check-in, you are free to discover Bodø on foot. A relaxing day! Enjoy a leisurely morning in Bodø. A half-hour flight in the afternoon takes you from Bodø to Svolvær where you will be met on arrival and transferred to your authentic fisherman’s rorbu beside the sea. At Svinøya Rorbuer considerable emphasis has been placed on maintaining the authenticity of the rorbu cabins. Time-honoured craftsmanship and timber have been preserved in order to provide a feeling of what a rorbu cabin was like in the days when the fishermen harvested the seas of Lofoten on boats with only oars and sails. In the evening you have an included guided Northern Lights hunt with a local guide. A free day to try one of many optional activities such as Sea-Eagle or Whale Watching by rib boat, hire a car and explore independently, or simply relax and potter around the beautiful town of Svolvær at your leisure. You have a second free day to explore the Lofoten Islands before boarding Hurtigruten for your overnight sailing as the ship arrives into the town at 2100 and departs at 2200. I would highly recommend dinner at “Børsen”; a top restaurant in Svolvær attached to your accommodation, prior to your cruise. Hurtigruten are not your typical “cruise”. The ships are regular service vessels carrying freight, mail and passengers along the 2,500 nautical miles of coastline from Bergen to Kirkenes. This is public transport with comfortable accommodation, great food, and another chance for Northern Lights spotting. During the night the ship calls at a number of ports on the Vesterålen Islands and next day you sail up the coast to Tromsø arriving at 1430. En route you will enjoy the splendid Hurtigruten lunch buffet. Your hotel is situated literally a minute’s walk across the quayside from where the ship docks. The Scandic Ishavshotel is something of a landmark, located directly in the harbour, with a view across the sound. This is the very heart of Tromsø and is situated amongst the city’s shops, restaurants, bars and within close proximity to the airport bus stop and the Tourist Information Office. In the evening travel my minibus just 25 mins to a Wilderness Camp away from the light pollution of Tromso. Here you will hopefully have an opportunity to see the Northern Lights and visit your hosts’ husky kennel and puppy yard. A traditional meal is served inside a wooden building around a roaring fire. Two free days to explore Tromso. Weather dependent you could spend a day in the Lyngen Alps on a snowmobile or enjoy the day experiencing the local Sami Culture and Reindeer Sledding. Alternatively, Tromso hosts the Polar Museum and many other great city attractions. Tip: If you want to enjoy one of the ice hotels or snow activities then why not travel in January or February to increase your chances of snow. Also, bear in mind the new moon dates as the moonlight can have a detrimental effect on the Northern Lights viewing.